Recently I presented a workshop on basic core and balance exercise. The workshop was designed for fitness professionals, to equip them with ideas to share with their their individual and group clients. We reviewed basic isometric poses and dynamic movements to safely affect one’s core and ultimately positively affect their balance. Proper exercise execution was accomplished by maintaining a stable spine and pelvis through a posterior pelvic tilt. We discussed the importance of how being familiar with our abdominal and gluteal muscles will be the key to optimization; working correct muscles and lowering the risk of incorrect movement. We discussed the difference between anterior and posterior tilt. In anterior tilt, the abdominal and gluteal muscles tend to disengage leading the top of the pelvis to tilt forward. It was concluded that this can increase the risk of low back compression and approximation issues. When consciously trying to accomplish a posterior tilt the abdominal and gluteal muscles will engage. It was understood that people are not ‘in-touch’ with their gluteal and abdominal muscles and that by teaching them how to engage these muscles, how to keep the pelvis strong and flexible, would be beneficial. I expressed the importance of maintaining the posterior tilt while completing all exercise, not solely the exercises prescribed in the workshop. My thought was: once people begin to incorporate the pelvic pose into all exercise then they would be more likely to keep their abdominal and gluteal muscles engaged throughout all activities of daily living. Having a stronger core and stable pelvis would create better balance which in turn, would help to reduce the risk of incorrect movements and possibly lower the risk of injury. The workshop was well received. I observed as the fitness professionals tested the exercises. It was wonderful to witness the group as they realized how basic the ideas were and how easy they were to apply. After the workshop, I had various fitness professionals inquire about the posterior pelvic tilt. Some shared that they teach the same thing but add in the idea of “neutral spine/pelvis” (somewhere between posterior and anterior). It was fantastic feedback. I considered it an important point to address in future workshops: the need to understand neutral spine/level pelvis. A few days after the conference I was approached by another fitness professional that attended my workshop. He told me that he had done some post-workshop research and found information suggesting that posterior pelvic tilt should never be done. We discussed neutral spine again and it made me think I should clarify a key point. Most people have a slight anterior pelvic tilt, I have seen it over and over in fitness and health services alike. By suggesting a posterior tilt posture the common result in a more level pelvis, less of an actual posterior tilt. The fact is, most people are not in-tune with their bodies as well as they could/should be. That is why we fitness professionals, are so important. Not only do we prescribe exercise but we also evaluate people’s fitness levels and help them understand and assess themselves. 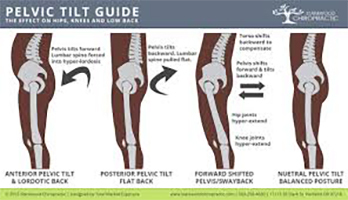 While we are discussing pelvic posture, it is important to know if someone suffers from sway back (a posterior tilt) then they should not try to accomplish an increased posterior tilt– they will have different postural goals to accomplish while exercising. Have a look at my handout in the documents section for: Exercises to help reduce posterior pelvic tilt. In closing, I believe I will add to my presentation: the importance of being connected and in control of abdominal and gluteal muscles to move the pelvis into anterior and posterior tilt as well as the importance of finding the balance between the two and create a level pelvis/neutral spine”.